POUSLBO, WA--(Marketwired - July 26, 2013) - Hellas Sports Construction is nearing completion of the design-build to the Naval Base Kitsap-Bangor Fitness Center's multipurpose turf field and new track surface. 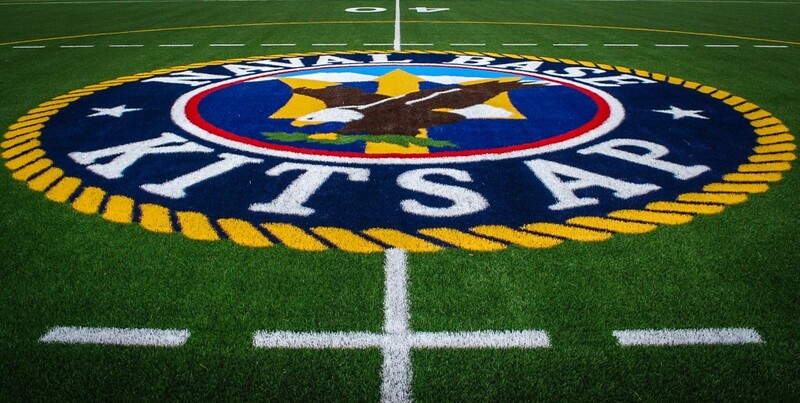 The new synthetic turf will sport markings for flag football and soccer as well as the vibrant Naval Base Kitsap Emblem at the midfield line. The Navy Intramural Sport Program will use the field to support Flag Football, Ultimate Frisbee and Soccer. When not in use for the Naval Base's organized sports programs or recreation for patrons, the Navy Command will perform physical readiness training on the new surfaces. Hellas Sports Construction develops and manufactures the most state of the art products in the turf industry. The turf is designed for high durability and excellent longevity. The epiQ TRACKS™ system, also by Hellas, has proven an enhanced performance running surface providing increased speed and control. "Our troops deserve the most up-to-date facilities. These additions and improvements will be of great benefit to the men and women of the Navy and their families. I am very pleased they chose Hellas," said Reed J. Seaton, President and CEO of Hellas. "We have not had a soccer program for four years because of poor field conditions. In FY14, we are excited to be able to re-introduce soccer to our program," commented Beth Leone-Mullins, MWR Installation Program Manager at Naval Base Kitsap. The first program to take place on the field will be the Navy Flag Football Season, which begins in August. The Base averages nearly 28 teams equating to 560 players. Naval Base Kitsap serves as the host command for the Navy's fleet throughout the West Puget Sound and provides base operating services, including support for surface ships and submarines homeported at Bremerton and Bangor. NBK also provides world-class service, programs, and facilities that meet the needs of hosted warfighting commands, tenant activities, crew, and employees. NBK is the largest naval organization in Navy Region Northwest and is composed of installations in Bremerton, Bangor and Keyport. The Bangor Fitness Center is located in building 2700 at Naval Base Kitsap Bangor and is open to all eligible MWR patrons. Hellas Sports Construction is a nationwide contractor with a strong reputation for delivering premium-quality sports construction projects across the United States. In addition, Hellas has the ability to custom-manufacture and install proprietary brands of synthetic surfaces for field sports, running tracks, and tennis courts, by controlling all related operations. In addition to a headquarters in Austin, Hellas operates several US-based offices. Clients include the NFL Experience, Cowboys Stadium, Baylor University, University of California, Berkeley, Idaho State University, the Alamodome, Northern Arizona University, University of North Carolina at Charlotte, University of San Diego, University of Georgia and various other prominent high schools, collegiate institutions and stadiums. For more information, visit www.hellasconstruction.com,www.matrix-turf.com and www.epiqtracks.com.